Filmed in 16 millimeter, stored in cans and sent back to the mothership via buses and other available moving vehicles, the WFAA-TV news of the 1960s and ‘70s has a frontier look and appeal that will never get old. Consider it the Wild West of local television journalism, with the stories somehow surviving the hardships required to get them into living rooms. “I got goosebumps watching that,” said veteran current day WFAA investigative reporter Brett Shipp, whose late father, Bert Shipp, was a legendary figure in those days as both a reporter and for a while, the station’s news director. 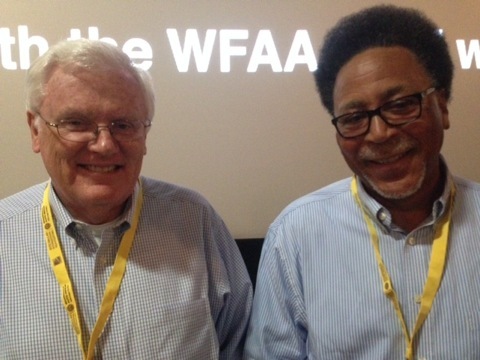 Attendees at the Dallas VideoFest’s Saturday evening “How the News Got Made” event, co-sponsored by the Press Club of Dallas, had just seen an 18-minute film of WFAA news coverage from 1968 to 1973. It represents barely a blip from a wealth of WFAA Newsfilm being preserved in a climate-controlled vault and digitized can by can under the guidance of the G. William Jones Film and Video Collection. The WFAA of those days also captured the opening of DFW Airport, preparations for the first game at the Texas Rangers’ old Arlington Stadium and ace reporter Don Harris grilling an airport administrator about security issues. Former WFAA reporter Bill O’Reilly also could be seen interviewing 14-year-old ventriloquist Jeff Dunham and Monty, one of his dummies. More on O’Reilly a bit later in this broadcast. You’ll want to stay tuned. Shipp introduced panelist John Sparks as the true maestro of WFAA’s storied investigation of payoffs to SMU athletes, which resulted in the university receiving “the death penalty” in 1987. “(Sports anchor) Dale Hansen took all the credit, but ‘Sparky’ did all the work on the SMU scandal,” Shipp said. Jim Green, an anchor reporter at WFAA from 1970 to ’73, praised Harris as the gold standard of local TV news reporters during his brief tenure at the station. Harris both reported and co-hosted a live morning TV news program, News 8 Etc., during much of his tenure from late 1969 to 1973, when he left over a dispute with management and joined NBC network news. In 1978, he was shot and killed in Guyana while covering the Jim Jones-run People’s Temple cult. 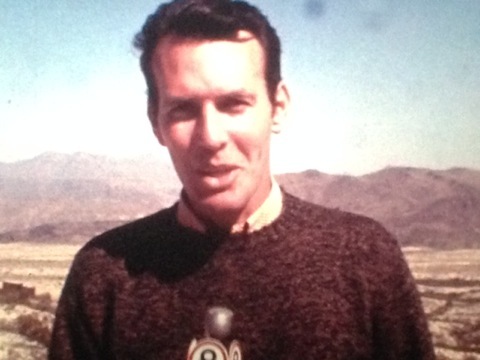 The 18-minute film shown on Saturday ended with Harris doing his standard “News 8” sign off. Photographer Jenkins found himself in the thick of many memorable moments, including the time that developer Trammell Crow “sucker-punched” investigative reporter Byron Harris, who was Shipp’s longtime running mate until retiring from WFAA last year. Jenkins said he also filmed O’Reilly’s first story at WFAA, in which he boasted that he could shoot and score against a Dallas Black Hawks goalie. “He didn’t even come close. And it was embarrassing,” Jenkins said. O’Reilly, a mainstay at Fox News Channel since it launched in 1996, stayed at WFAA for only about a year. He seems to have been despised by just about all of his colleagues. “We gave him a chance, all right,” Sparks said. “Tracy Rowlett decked him in the news room.” Jenkins remembered trying to break it up. Haag eventually suspended O’Reilly, who relocated to a Denver TV station and since has made untold millions of dollars as the host of FNC’s most popular show and the co-author of a series of bestselling “Killing Of” books. One of them, Killing Kennedy, further rankled both Rowlett and Harris. O’Reilly for his part has long been publicly disdainful of WFAA, terming it a bad fit for his talents. And whatever the animosity from those who knew him at the time, it can hardly be argued that he hasn’t had the last laugh. Haag juggled it all and transformed WFAA into a nationally recognized laboratory for future network anchors and reporters. “He was different. He saw the future” beyond covering car wrecks and fires, Jenkins said. Today’s TV news is driven in large part by the dictates of audience demographics, “social media” presence and budget cuts that increasingly require reporters to also shoot and edit their pieces. “I don’t watch much of it anymore,” said Sparks, who also has worked behind the scenes for D-FW’s three other major TV news operations -- Fox4, NBC5 and CBS11. Shipp chose to hold his tongue while also making it clear that he’s also not entirely enamored with how things are changing. Shipp, who has not responded to further efforts to communicate with him, is fully entitled to his opinion.